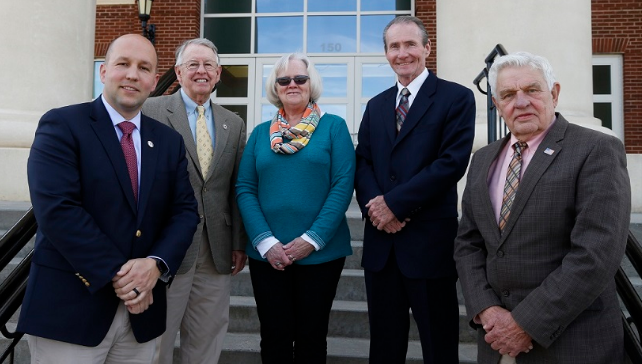 The Ashe County Board of Commissioners holds regular meetings on the first and third Monday of each month at 9:00 a.m. in the Commissioners’ Meeting Room (small courtroom) on the third floor of the Ashe County Courthouse. If a regular meeting is a holiday on which county offices are closed, the meeting will be held on the next business day. CITIZENS ARE INVITED to participate in Commission meetings. It is our hope and desire that everyone will benefit from your participation. In order for this to occur, we request that you familiarize yourself with the established procedures for these meetings. AGENDA ITEMS are scheduled in advance of the meeting date and emergency issues that require immediate attention only modify the agenda. The deadline for including items is Tuesday at 8:00 a.m. prior to the Monday of the meeting. At the beginning of each session, the Chairman will ask for additions or deletions to the agenda prior to calling for it to be adopted. The agenda is for the convenience of the public and the Board, and may be amended by the Board as necessary. PUBLIC HEARINGS are for receiving testimony from the public on certain resolutions, ordinances, or amendments prior to taking action. A hearing is not a dialogue or debate. Its express purpose is to receive additional facts, comments, and opinions on agenda items. Speakers should approach the podium so they may be visible and audible to the Board, staff, and audience. Each speaker should clearly state his/her name and address. All questions should be directed to the Chairman. Members of the Board are not expected to respond to questions and response to questions is made at the Chairman’s discretion. Speakers are encouraged to contact staff after the meeting regarding unresolved concerns or to receive additional information. Speakers with questions are also encouraged to call County staff prior to the public hearing. Occasionally, issues of such significance or popular appeal will require that a sign-up sheet is necessary in order to allow everyone an opportunity to be heard. The sign-up sheet will typically be located at the front entrance of the Board/Court room. Speakers arriving, or wishing to be heard after the commencement of the hearing, will be recognized at the discretion of the Chairman. Repetitive testimony is discouraged. To facilitate hearing as many citizens as possible, a specific time limit will be imposed, in which time will be allocated among the registered speakers. Seating will be limited to the legal capacity (for fire safety) of the Board/Court room. All citizens will be allowed an opportunity to speak. Come forward to the speaker’s podium after being recognized by the Chairman. If you have a written statement, please provide a copy, along with any other supportive material, to the County Clerk to the Board. Comments should be directed to the entire Board and not to one individual commissioner. Please limit comments to no more than three minutes. Speakers arriving or wishing to be heard after commencement of the Public Comment session will be recognized at the discretion of the Chairman. WE URGE citizens to help the Board preserve decorum in order to conduct the meeting in an efficient and responsible fashion. Please refrain from clapping or other public demonstrations of support or opposition. Please be respectful of others and their point of views. We thank you for your participation and courtesy and invite you to return.